Spring in my area of the U.S. has been quite elusive this year. We are still awaiting its arrival! However, despite spring being in hiding, I persisted with my spring cleaning rituals. Having a non-magical house that doesn’t grow in size to accommodate the stuff in it, I knew it was time to part ways with some belongings. My goal was to find another home for anything I could that my kids and husband would not notice missing. I was getting all kinds of advice from neighbors and friends on how to sell online—something I have never done before. I was not keen on strangers coming to my house to pick up furniture or other items I was selling from websites. Recently, I went to my township building to pay the trash bill and found a beauty of a parking spot! 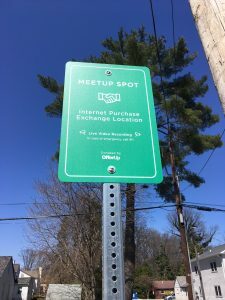 This simple parking spot opened up the world of online selling to me. It is called the Meetup Spot and is reserved for people buying and selling their treasures online. Now, with this type of reserved and monitored parking spot outside our township government and police buildings, my fears of online selling are gone. I got a parking spot for that!